Then shortly after EDI met the Internet, AS2, and the next generation of managed EDI integration Services in the cloud. It proliferated EDI usage by driving down costs and delivered ROI end results in the EDI investment. It took distributors, retailers and big buyers from only trading EDI with the top 10% to trading EDI with 80-90% of their trading partners for basic order to cash document processes. Today, we are in the third inning. 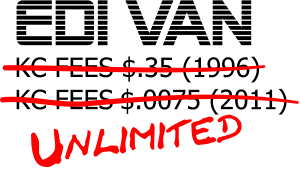 VAN fees are in a range of $.03-$.0075/KC and the only companies still buying EDI software are EDI supply chain business service providers. Managed EDI service providers have converted the entire old software user clients since they can manage new trading partner implementation costs at approximately 10-20% of the cost of an EDI software user bringing in a consultant to make that connection. And the big buyer distributor, retailers, who already have 80-90% of suppliers and vendors implemented on EDI are now further leveraging these electronic information connections with more data, visibility, and communication with inventory, product movement, and logistic information. Which brings to the title of this piece - the heritage VAN KC pricing model is obsolete. The vast majority of cost associated with EDI is associated to professional consultant setting-up, support, or troubleshooting an EDI connection. These costs have been reduced since manage service providers can re-sell the connection work done for one client to hundreds or thousands of other subscriber connections. But the cost of basic simple VAN mailbox network service of passing and storing raw data is based on server farms and storage costs. Anyone familiar with the income statements of EDI service providers will notice that the VAN infrastructure server and communication costs make up approximately 10% of the overall costs at most. While EDI managed services have been growing naturally at a rate of 15-20% a year for EDI service companies, the base VAN services revenue is flat to shrinking. That is due to KC costs falling every year since 1996 while volume has increased. Let's not forget AS2 direct EDI over the Internet communication. However, this type communication is not free. If one would add in the support costs of AS2, with changing certificates and keeping servers and back-up servers in an all-time up-time mode, it might be as much if not more than current basic VAN costs. If costs of EDI and VAN services are not closely correlated to the volume of data sent and end-users of EDI services want to send more data but are not willing to pay per character fees for the data, why are VANs still charging by the KC? It seems to me that the third inning of B2B eCommerce game could be a big inning for the team who comes forward with a flat unlimited data plan which promotes EDI users to share more data with more trading partners for inventory, product movement and logistic status updates. With more data comes more complexity in managing the data. This is the real opportunity. A flat-fee unlimited data network would get the benefit of having the champion EDI users promote their network for connectivity which translates to more customers/subscribers (although at a cost $0 margin rate). Then the real opportunity is opening up data management tools to the subscribers for premium fees. Do these users have tools and dashboards in their ERP to manage inventory, store level product movement and logistic status updates? Are the tools/dashboards any good? This might launch the EDI VAN into demand planning and forecasting services. Just in the last few months there have been advancements and new VAN pricing strategies brought to the market. One such company is NewEDI.com . Quite simply, NewEDI.com is the Priceline of the basic VAN service. You name your price and NewEDI works to fulfill that deal. An interesting approach considering all providers are considered equal in quality and reliability but still a per KC model. Loren Data LD.com, has pioneered the automation and integration of EDI service providers with basic VAN services. This approach take a costly step out of the setup process - the human. And lastly, we have the new contender, Infoborders, the EDI dashboard, visibility and no-fee EDI testing platform is rumored to be working on a flat-fee unlimited VAN offering for the market. Infoborders plans to upsell reporting and visibility tools to clients. Being around for inning one and two, I believe the third inning will bring the crowd to its feet and a new front-runner to the game.